After the Stony Brook game, she went around the locker room and asked each player to discuss what was hindering the team’s performance. The dialogue was time-consuming—the coaches did not leave the room for more than half an hour—but it kicked off a spirited week of practice that translated onto the court. 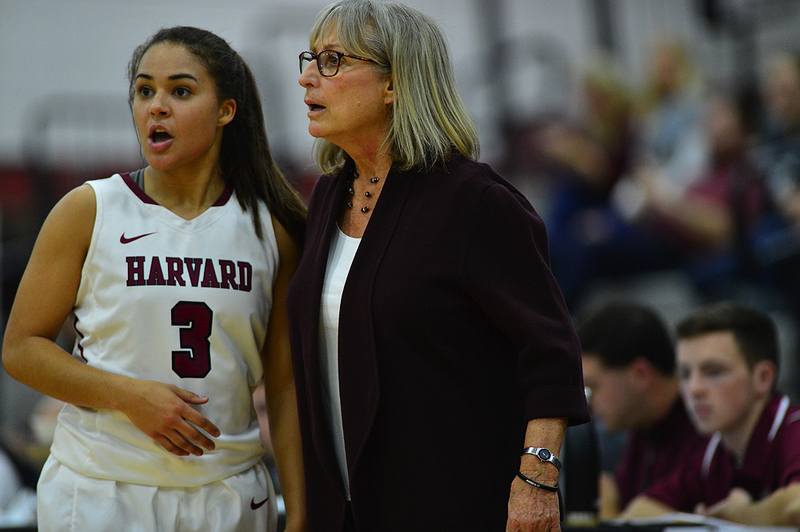 Although Harvard fell the following weekend in its Ivy opener at Dartmouth, the Crimson swept its next two games: a 70-61 victory over LaSalle and, more significantly, a commanding 76-65 win over Dartmouth in Saturday’s rematch in Cambridge. The wins improved Harvard’s record to 9-6 overall and 1-1 in Ivy play; now the team enters the heart of conference competition. Last year, the Crimson won 16 consecutive games (tied for a program record) to start 16-1. Then, they sputtered, losing six of their last 10 regular season games before falling to Princeton 68-47 in the Ivy League tournament. The Crimson quickly did that, defeating Siena, Sacred Heart, and Boston University in a streak that showcased its diverse weapons: point guard Katie Benzan ’20—a first-team All-Ivy selection as a freshman—tallied 22 points against Siena; Jeannie Boehm ’20, a talented post player, recorded 16 points and 12 rebounds against Sacred Heart; and senior Taylor Rooks had 22 points and 11 rebounds against BU. The turnaround also suggested a silver lining to the setback against Maine. Instead of last year’s long winning streak that collapsed into a string of letdowns, a disappointing loss early this year, Boehm pointed out, forced the team to confront its problem areas right away. Still, Delaney-Smith had concerns, especially after the tight win against Stony Brook. Opponents were finding ways to contain Benzan, who is a talented outside shooter and terrific ball handler but sometimes struggles to beat a defender one-on-one and generate her own shot. Teams were assigning tall or athletic defenders to guard her, forcing her to take difficult shots or give up the ball. That’s what happened against Stony Brook, where Benzan had just eight points on two-of-seven shooting. The coach was also concerned about Boehm, the team’s most talented frontcourt player. Last year, the sophomore’s preferred post move was to use a fake and then come back to the right. Defenders were now looking for this and sliding with Boehm, which forced her to fade away from the basket. Complicating matters, she sometimes grew frustrated when she missed. The coaches had worked with her to diversify her post moves and stay even-keeled, but against the Seawolves, Boehm missed a couple of shots and reverted to her familiar move. She finished the game with just six points. Finally, the coach lamented her team’s lack of emotional intensity, something she attributed to “fluctuating levels of confidence.” Sometimes the team failed to celebrate successful plays; this impassivity was part of what prompted the coach’s warning about Ivy play. The Crimson bounced back four days later against LaSalle and put together one of its best performances of the season in Saturday’s rematch with Dartmouth. Benzan had 20 points and made six three pointers, several of which came on nifty plays where she dribbled past or used screens to get around aggressive defenders. On the inside, Boehm stuffed the box score with 16 points, 14 rebounds, 5 assists, 3 steals, and 2 blocks. She also looked far more comfortable in the post, finishing a variety of moves with her left and right hands. The Crimson will need to sustain that intensity as it enters six consecutive weekends of back-to-back Ivy League games. The conference is currently ranked ninth nationally out of 32 leagues in the Rating Percentage Index. (The RPI ranks teams and leagues based on their win-loss records and strength of schedule.) It also features several teams—Princeton (48), Harvard (89), and Brown (90)—in the top-100 of RPI team rankings. The Crimson is in the thick of the Ivy League title hunt, but the competition will be fierce, beginning with home games next weekend against Yale and Brown, both of which are also 1-1 in Ivy League play. The men’s basketball team defeated Dartmouth 62-57 in overtime in Hanover on Saturday. The Crimson (7-10 overall, 2-0 Ivy) were led by Seth Towns ’20, who had 26 points and six rebounds and sank a pair of free throws with 2.8 seconds remaining to send the game into overtime. The win gave Stemberg men’s coach Tommy Amaker his two-hundredth victory at Harvard. The Crimson were again without leading scorer Bryce Aiken ’20, who has missed six of the last seven games with a knee injury.